What Does Good Hygiene Actually Mean? For most people, it’s no secret that good daily hygiene is the key to keeping their smiles healthy for life. However, many people still develop conditions like periodontal disease (also known as gum disease). In some cases, it’s because people fail to stick to what they know about good hygiene routines, but often, it’s because they don’t realize where exactly their hygiene routines are lacking. At our Encinitas/San Diego periodontist’s office, good hygiene education is one of the most important preventive measures we provide. The most commonly known goal of routine dental hygiene is to keep your teeth and gums clean of lingering food particles and oral bacteria, which band together to form plaque. Brushing your teeth twice and flossing at least once every day is essential to removing plaque, and you should pay special attention to cleaning along your gum line each time. Also, stick to a schedule of routine dental checkups and cleanings to remove traces of calcified plaque (tartar) that your toothbrush and floss can’t remove. While keeping your teeth and gums clean is a well-known part of good hygiene, your diet and overall nutrition are often overlooked. In order to stay healthy and ward off dental disease, they require an ample supply of essential nutrients, just like the rest of your body. Be sure to eat plenty of vegetables, proteins, and nutrient-rich whole foods, while avoiding highly acidic and sugary foods and beverages. Also, avoid snacking often throughout the day, as the more often you eat, the more active oral bacteria become. 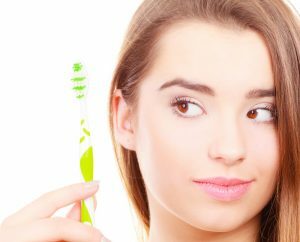 Your smile comes with a few natural defense mechanisms that need to remain strong, and that you should pay close attention to as part of your daily hygiene routine. For example, your saliva is a natural defense and neutralizer of harmful oral bacteria. Drinking plenty of water throughout the day boosts that defense and helps ensure a steady flow of saliva. You might know that good hygiene is important to your smile, but it takes a little effort to ensure that your hygiene routine is consistently good enough to offer optimal protection. For more information, schedule a consultation with Dr. Kania by calling her periodontal office in Encinitas/San Diego, CA, at (760) 642-0711.